Mercedes-AMG C63 Interior, Sat Nav, Dashboard | What Car? The C63 comes with an electrically adjustable steering column and heavily bolstered sports seats, while the C63 S gets even more figure-hugging, semi-bucket-style chairs. Both seat types have fully electric operation, so nobody should have an issue getting comfortable. They're supremely supportive, even on long journeys. The driving position is very good overall, the one weakness being the transmission tunnel that bulges sideways, impinging on your left leg. Forward visibility is fine, but the coupé, convertible and, to a lesser extent, saloon are tricky to see out the back of. The estate, by comparison, is fine. Either way, fear not, because all-round parking sensors and a rear-view camera are standard, while a 360deg camera is a worthwhile optional extra. All models come with adaptive LED headlights that are not only bright but also can stay on main beam even when there are cars in front. 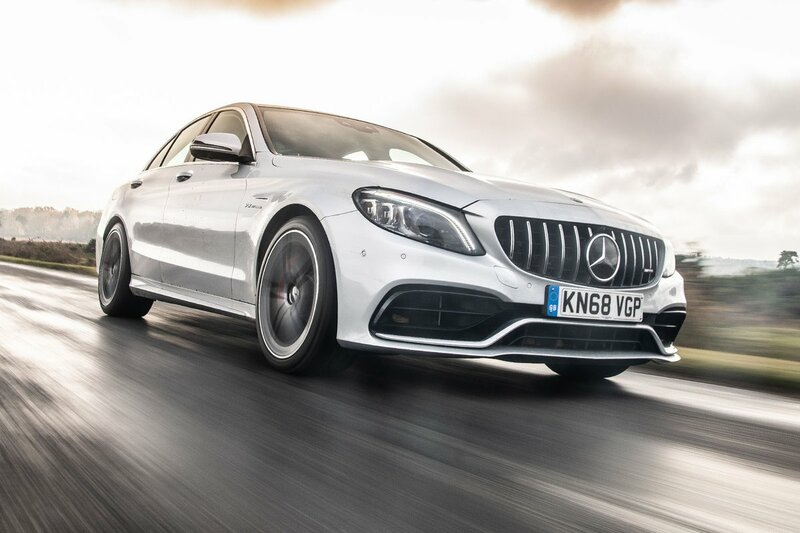 All C63s get the C-Class’s top-spec Comand Online infotainment system and sat-nav. This comes with a 10.3in screen controlled by either rotary or touchpad controls. The graphics look great, but it can be tricky to use, because the menus aren’t always obvious to figure out. Still, while it’s less intuitive than BMW’s iDrive and Audi's MMI, it's miles better than the system in the Guilia QV. The rest of the C63’s controls are well laid out, and as standard it comes with a configurable, 12.3in screen where you'd expect to see analogue instrument dials. This means that you can alter the style of the digital dials and display maps, media and various other information where it’s easy to see. There’s a real flamboyance to the C63's interior and a plush mix of soft nappa leather, brushed metal and gloss-black plastic surfaces. It has a much more premium finish than the Giulia QV but in places doesn’t match solidity of the RS4 Avant.